Bourton Cycles is located in the historic, picture postcard village of Bourton-on-the-Water in the heart of The Cotswolds, close to the crossing of the River Windrush and Roman road, the "Fosse Way". Surrounded by stunning Cotswold scenery, Bourton is the perfect place to set off on a cycling adventure whether that be a gentle leisure cycle taking in the local pubs and tea rooms, to the more adventurous long distance treks with plenty of deceptively challenging hills on offer. With the village very much a tourist centre, Bourton Cycles has a fleet of hire bikes to offer the visitor, including a couple of tandems for those happy to test their teamwork. The shop is owned and run by husband and wife team Kev and Sue Whitehill, both very keen cyclists. They manage the business side of the shop with the mechanical work being looked after by Andy, a Cytech Level 3 mechanic and enthusiastic mountain biker. Kev willingly test rides new road kit (any excuse to be out on his bike!) whilst Sue is a keen triathlete and is an organiser of the first Bourton Triathlon to be held over the weekend 22-23 June 2013. The shop and its club actively take part in sportives and triathlons proudly wearing Bourton Cycles kit. 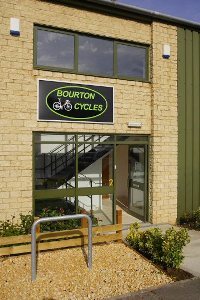 Bourton Cycles sell a broad mix of road, MTB and hybrids from Cannondale, Merida, Marin and Dawes with all sales backed up by excellent after-sales service from the superb on-site workshop, keeping all customer bikes in prime running order. From custom builds of bikes and wheels, to gear servicing and checking brakes the focus is very much on the customer. A good range of accessories and clothing from the likes of Shimano, Cateye, Endura and Altura are stocked, so all cycling requirements are covered. Another hook is being ‘female friendly ' with women specific advice on saddles, bike-fit and clothing. The shop prides itself on being part of the local community. This year Bourton Cycles offered mechanical support to a road sportive routing through The Cotswolds and took a cycle themed part in the Jubilee celebrations in the village. Saturday rides from the shop are open to anybody that enjoys cycling. Biketrax has been serving its Edinburgh customers since 1996, with a mixture of hydrid bikes, folding bikes, road bikes and kids bikes. A range of mountain bikes are a more recent addition to satisfy their off-road customers. 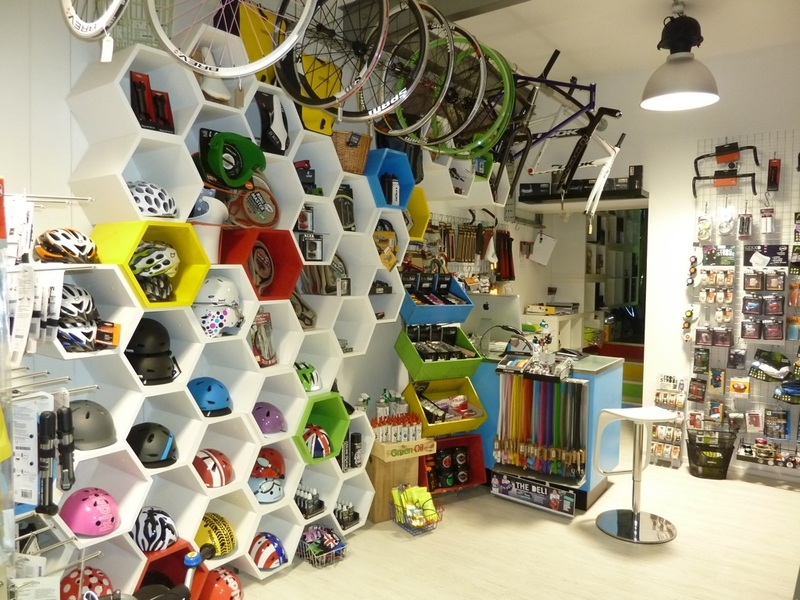 The shop is located in the busy central location of Tollcross, an area that describes itself as ‘The Cycle Shop Centre of Edinburgh' - there are no less than 12 bicycles shops in the close vicinity! Ideally positioned, Biketrax, captures custom from local commuters, road cyclists and mountain bikers for both sales and servicing. Cycle-to-work customers can buy a bike at Biketrax via Cyclescheme. The main brands stocked at Biketrax are Genesis, Trek and Ridgeback. More specialist city cruiser and retro styles rides are offered by Pashley and Bobbin. The iconic collapsible Moulton range is also stocked in the shop. It's in the folding bike department that Biketrax really starts to sing - more specifically Brompton folding bikes. They are the only Brompton dealer in Edinburgh and the largest Brompton dealer in Scotland with a large range of bikes in stock in the many model and colour combinations. The shop specialises in Brompton servicing and repairs plus stocks a full range of parts and accessories. A mail order service is also provided on their website. Clothing and accessories are provided by the likes of Brooks, Carradice, Altura and Ortlieb. Biketrax also offer a bike hire service that is very popular with tourists visiting Edinburgh and choose to see its many attractions from 2 wheels. The busy workshop is staffed by two full time mechanics, Greig and Dougie who take pride in offering a speedy turnaround. Following the Brompton theme, hub gear repairs is one of the more specialist services offered at Biketrax. All repairs carried out by Cytech Level 2 technicians. All the staff at Biketrax are fellow cyclists and can be seen commuting to and from the shop on workdays or on the local trials and towpaths at the weekend. Cycling is ingrained in Dutch culture and society. Cycling in Holland is a part of everyday life, like doing the shopping or grabbing your morning coffee. The Bicycle Man, Anwar Marzak, aims to bring a bit Amsterdam to the streets of London and encourage us to ride more on one of his Dutch style bikes. The Bicycle Man is located on the busy east to west thoroughfare, Old street in the City of London. The iconic cycling café, Look Mum No Hands, is just a few doors away. Thousands of potential customers ride past the shop every day. The product focus is orientated towards classic & Dutch styles mixed with some great looking urban bikes, like German brand Schindelhauer and Foffa. The mix of brands is really well thought out and perfectly in tune with the needs of a modern, active, style conscious city. Traditional ‘Hollander’ bikes from the likes of Gazelle and Tactory mix with more contemporary styles offered by Van Moof and Urban Factor. The bias of the shop is definitely towards urban riding, commuting and cruising for pleasure. Whilst some bikes veer towards a more aggressive riding position, they are provided as solutions to the same activity – riding around London on the streets and in the parks. This is an ambitious outfit who have just exhibited at The Cycle Show in Birmingham, showing off their lovely European bikes to 25,000 people over the 4 days. The business also has a UK distribution arm for brands Achielle, Johnny Loco, Nomonro and BSP, plus a few others, if eager dealers want to get on board for a gentle, sedate ride. There is a workshop on site with menu pricing and all done by a Cytech Level 2 mechanic. 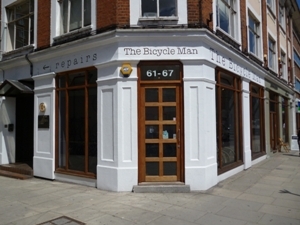 The Bicycle Man engages with their customers via Facebook and Twitter to keep them up to date of news and special offers. The shop subscribes to 2 cycle to work schemes – Cyclescheme and Bike2WorkScheme. So, if you are put off by the complexities of 30 speed derailleurs and prefer simple to use, and easy to maintain internal gears, head on down to The Bicycle Man for the continental touch. 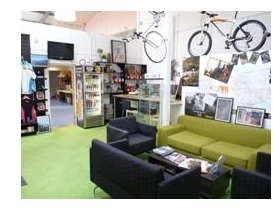 The ACT Shop of the Month, sponsored by Bikesoup is BikeLux in Newbury, Berkshire. The shop opened at the end of November 2010 and has grown month on month since, with a small but hard working and dedicated team. The main bike brand at BikeLux is Scott and regular demo days are hosted by the shop. The specialist end of the market is catered for by Yeti, for mountain bikes and Eddy Merckx, for road bikes. On-site workshop facilities deliver custom builds to general servicing and repairs. Finance is available on bike purchases and the shop has a healthy turnover of Cycle-to-Work business. Sales are roughly equal across road, MTB & commuter / hybrid bikes. The shop has it's own cycling team, BikeLux-Progression, a partnership with a local gym with whom the shop has forged a close relationship. The team mainly partake in XC races but nothing is off limits - riding is a priority for the members, so will do so as often as possible. Regular customer rides are organised, starting and finishing at the shop. This is a chance for all, whatever ability level, to come along and join likeminded people and see some new trails in the local area. 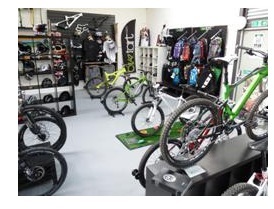 Like most ambitious recently opened IBD's, BikeLux utilises the Facebook & Twitter social networks to broaden their brand and keep their loyal customers up to date with activities and offers in the shop. With the 2012 London Olympics in full swing and with cycling riding the crest of a wave of popularity, the Shop of the Month for August is Off Camber in Blandford Forum, Dorset. Off Camber is very much a family affair and run by son Alex, mum Theresa and dad Julian. ‘Adopted son' and gravity junkie, Jack, is in charge of the workshop spanners. The shop sales mix is roughly even across road, mountain and hybrid/ city bikes with the main brands being Scott and Giant. More specialist road bikes are supplied courtesy of De Rosa and under Jack's instruction, some Nukeproof bikes have just joined the brand portfolio. Blandford Forum, home to some 13,000 people, sits proudly in the middle of the Dorset countryside with the popular mountain bike destination of the Dorset Trailway on the doorstep. Organised rides from Off Camber cater for mountain bikers on Monday and Tuesday with 35-40 mile road rides leaving from the shop every Thursday evening too. Off Camber sees itself at the heart of the local cycling community and sponsors riders in both XC and road cycling teams. There was even talk about them actually hosting their own event in the future... Not slow to identify a local opportunity, they sponsored a resurgent Blandford Triathlon in June this year. The shop organises regular bike demo days with the last one in April supported by all of their main brands - Scott, Giant, Charge, GT and De Rosa. All events are promoted through the Off Camber Facebook page, which is building up a healthy and loyal community of local riders who engage with the shop. To broaden their customer base they are exhibiting at the Gillingham & Shaftesbury Show on 15th August. The same shop site has been host to a bike shop for about 70 years when Lucas Cycles first opened its doors in the 1940's. 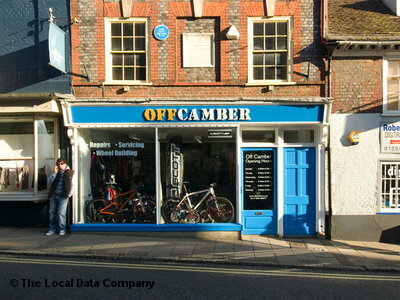 Off Camber has been in business for around 10 years and on the foundations of community, service and application, will be there, serving the cyclists of Dorset for many years to come. How many cycle shops are celebrating their centenary in 2012? We don't know but our guess is that it's not that many and it's that 100 years in business reached by Ben Hayward in Cambridge that make them deserved winner of the ACT Shop of the Month for July. Ben Hayward Cycles is a 3 site operation with a city centre shop on Trumpington Street in the heart of Cambridge, a Shimano Service Centre staffed by Cytech trained staff is around the corner next to the Anchor Pub and an out of town shop at Notcutt's Garden Centre in Horningsea. The focus of the business is all about high quality personal service and that has been rewarded with a large and loyal customer base. Online reviews praise the impartial service and willingness to sort out mechanical problems without fuss, even when the bike in question has come from a mail order retailer. Being in a city centre location most of the bikes stocked are either folding, from the likes of Brompton and Mezzo or road and hybrid bikes from Trek, Whyte and Wilier. With both shops being surrounded by the flat Fenlands, mountain bikes aren't big sellers but a good selection of Marin bikes are kept in stock. We also noticed a strong showing of British bikes with Pashley, Dawes and Moulton all on display. So, there we have it, Ben Hayward, a high quality independent retailer based in Cambridge with a fresh supply of needy students to serve every year and who will be drawn to the traditional values, just as they are at Cambridge University itself. We hope that the two Cambridge institutions live together in harmony for at least another 100 years. 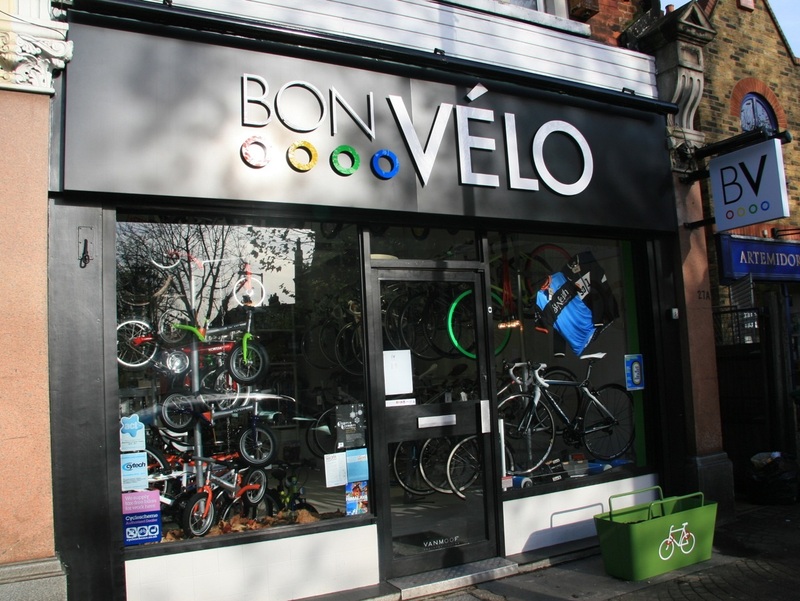 Bon Velo first opened it's doors to the good folk of Herne Hill, South East London on Halloween in 2010 and in 18 months they have built up a very strong and loyal clientele who are attracted to the excellent and friendly customer service. Run by partners John and Karina, who boast about Raleigh Choppers and hardtail downhill bikes on their internal CV's. These are real people who love bikes and that passion is communicated in a friendly and informed manner to their customers. We've met Karina and John at a number of trade shows and are drawn into the warmth, enthusiasm and knowledge that they both display in spades. Bon Velo have chosen their bike brands very wisely and feature a portfolio of well-known, but not mainstream, manufacturers. Road and city bikes are covered by Orbea and Charge. Look bikes veer more to high performance road, TT and triathlon. The fashion and image conscious will be happy with what is offered by Van Moof, Cinelli and Crème, whilst Moda and Ghost have a finger in every cycling pie going. The shop features a comprehensive range of clothing and accessories and stocks some of the latest brands like Morvelo, Ana Nichoola, Velobici and DZR. Nuun and ZipVit provide the rehydration and energy needs of anybody who has overdone it at the local and iconic Herne Hill velodrome. All products are showcased in a well-designed, clean, bright and engaging retail environment. The Bon Velo shop is complemented by a slick and professional brand logo and identity. The workshop is run by keen cyclist and very able ‘Doctor' Attila and his BMX obsessed assistant, Gabor (both Cytech Level 3 trained), whose passion for cycling matches that of their employers. When not playing with their spanners, Attila gets out on one of his bikes, hitting the road or the trial, the city or the country. Recently, John and Karina have been marketing Bon Velo more actively on Facebook and Twitter and using both platforms to engage with their customers and inform them of new products, special offers, events and holiday opening times. Other activities that the friendly Bon Velo bunch are involved with include, The North Kent Bikeathon in support of Leukaemia & Lymphoma Research and booze fuelled Rollapaluza National Series roller racing evenings at the Half Moon Pub around the corner. For the merry month of May, the Shop of the Month is Plush Hill Cycles in Church Stretton, Shropshire. Coincidentally, May 2012 is the 2nd Anniversary of this wonderful shop that is owned and run by mountain bike enthusiasts, Kate and Allen Timbrell. The couple are true fanatics and have ridden all over the world from the Moab Desert to competing in the epic Megavalance downhill race. The Plush Hill Cycles shop enjoys the enviable position of being in the heart of the Shropshire Hills at the foot of the Long Mynd. Other high quality trail riding is a few crank turns away at Hopton and Eastridge Woods. The locations provide the perfect opportunity for customers to try out the latest bikes from Yeti, Nukeproof, Saracen, Transition, Ghost and Singular in the extensive demo fleet. RAM bikes have just been added to the list of brands offered and Plush Hill Cycles is one of only a few UK stockists of this no compromise Bulgarian brand. Much of the success of Plush Hill Cycles can be attributed to the rider owned philosophy and encouraging customers to try all of the bikes on offer. There is nothing to beat riding a selection of bikes and comparing aluminium to carbon fibre frames, comparing 26-inch to 29-inch wheels and comparing single pivot to four bar suspension systems to find your perfect bike. The shop also offers bike hire with a selection of e-bikes and mountain bikes to choose from. Customers can keep in touch with organised rides, local events and shop offers by subscribing to the e-newsletter or via the clean and well-designed website. Social network subscribers are well catered for with daily posts to Facebook and Twitter, which helps to create a valuable loyal rider community around to the shop. One feature of the website that we really like was the BBC weather widget - great for both locals and weekenders. All of the hard work, investment and pro-active approach is having a very positive effect on the business and a new first floor showroom has just been opened together with a larger workshop and storage space to cope with demand for high quality repairs and parts upgrades. The Plush Hill Cycles MTB Team is very busy at the moment, competing in various endurance events, the UK Gravity Enduro series, Pearce DH series and the British Downhill Series. The 4 man Junior Downhill team are also planning to hit the bigger European hills over the summer and some one-off mass participation races. Kate and Allen feel very comfortable with the support given to the team as it keeps them connected to a sport that they both love and provides some real world integrity to the Plush Hill Cycles business. And the future? With such a strong mountain bike bias the obvious extension to the business is to engage more with road cycling. To that end 700c wheels and lycra bib tights have recently been spotted in the Church Stretton area. This month, the Shop of the Month is Biketart - a high quality cycling retailer based near Canterbury in Kent. Started by Adam Westwood as an online retailer of premium mountain bike parts in 2008, Biketart expanded into selling complete bikes from a retail store in 2010. A new showroom was opened in December 2011 and is part of a business that now includes a café, workshop, warehouse, and photographic studio. Biketart's success has been down to lots of hard work, a passion for high quality product, market awareness and harnessing social media to spread the word and create a community for loyal customers, many of whom have become both friends and riding buddies. Biketart has over 6000 Facebook followers and they are kept up to date with demo rides, product releases, videos, sale items and organised rides from the shop. There is no hard sell - it's all about creating community and increasing customer loyalty. Some lucky customers will even enjoy some of Europe's best riding in the French Alps whilst staying at an exclusive chalet in central Morzine, hosted by Biketart and Rude Chalets. Sales are split about 60% online and 40% in-store. Online bike sales are around 5% of total bike sales and all customers are encouraged to visit the shop for a custom bike fit. A computerised fitting rig is in the pipeline as Biketart looks to capture more business from road cyclists who enjoy riding along the beautiful Elham Valley, where the shop is located. Organised road rides are on the calendar for the first time in summer 2012. Seeing itself as a valuable asset in the local community, Biketart supports the local primary school with free helmets, lights and locks, helping more kids to benefit from a free breakfast that's offered to those who cycle to school. Product was also donated to a charity auction that raised funds for the renovating the Barham village hall. 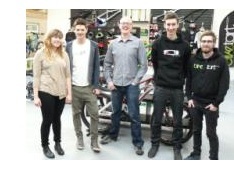 Cycling club members at the University of Kent are sponsored and offered a student discount on bikes, parts and clothing. The shop was one of the feed points on an annual sponsored ride that raises funds for the local Pilgrims Hospice that provides specialist palliative care for the people of east Kent. Whilst the average bike at Biketart sells for around £2500, a new range of sub-£1000 bikes have been introduced for 2012 and combined with marketing activity targeting local employers, aims to increase the number of Cycle to Work customers. It's fair to say that most of the bikes currently on sale are from high quality specialist manufacturers and include Santa Cruz, Colnago, Ibis, Look, Mondraker, Orange, Transition, Eddy Merckx and Saracen. The shop has an extensive demo fleet and all customers are encouraged to try before they buy. Bikes are also shipped to the shop by suppliers for a specific customer to try out. This service is provided completely free of charge, irrespective of whether is sale is made or not. The whole ethos of Biketart is about creating a loyal community of cyclists by offering a range of products, services and events that bring everybody together. Much of Biketart's success can be attributable to its rural location with great road and off-road riding on the doorstep, affordable space and close proximity to 3 large populations in Canterbury, Ashford and Folkestone. When asked to define Biketart, the staff used words like - friendly, good service, enthusiasts, cool brands and different. All of these elements contribute to a thriving business that prospers from attracting and engaging with a loyal customer base. What about the future? The shop already has a lovely café area but this will be expanded this year to become a bistro serving breakfast and lunches to hungry riders. Another very good reason for customers to visit the shop even more often.